This is the summary of consumer reviews for Summer Multi-Use Deco Extra Tall Walk-Thru Gate. The BoolPool rating for this product is Excellent, with 4.50 stars, and the price range is $48.74-$89.99. The Summer Multi-Use Deco Extra Tall Walk-Thru Gate is a stylish, easy to use gate that comes with versatile pressure or hardware mounts. 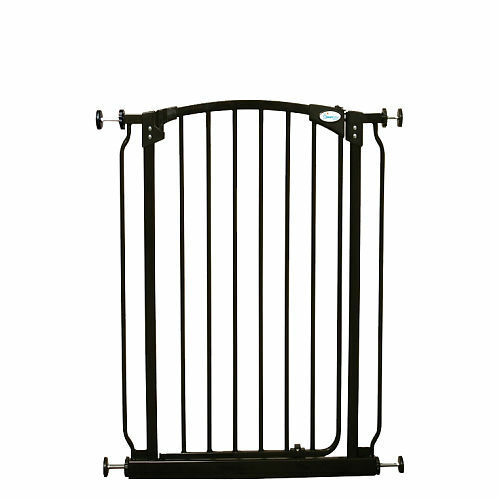 This gate stands tall at 36" high and fits openings 28" to 48" wide. It is easy to open with its lift-and-push/lift-and-pull options. It is sturdy, strong against pushing, and easy to put together. This gate is functional as well as decorative. For your convenience, the gate offers one-handed operation and auto-closure. However, Summer Multi-Use Deco Extra Tall Walk-Thru Gate may bend if not constructed properly. It may need some additional hardware to install in certain cases. 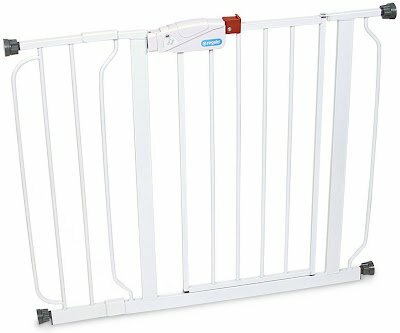 Overall, the Summer Multi-Use Deco Extra Tall Walk-Thru Gate is a great product that can be used between rooms or at the top or bottom of stairs for safety of kids and pets. 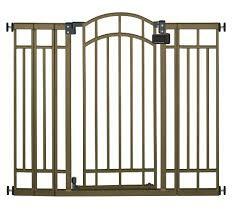 Now you can child proof your home in style with this Multi-Use Bronze Deco Extra Tall Walk-Thru Gate. It has hardware included for extra secure mounting, or pressure mount for a secure installation that doesn’t leave marks on walls. Sturdy, attractive, easy to install. Gate was an easy install. This's a very sturdy and easy to instal gate. This gate is attractive, strong, easy to install and use! The style fits beautifully with our decor and it was easy to install. It was so easy to put together and install and it's very sturdy. Super easy to install between two posts with no drilling or screws necessary. I looks amazing, closes automatically after you, was easy to install and after about 2 months we still havent had one problem with it. Our friends found it not only attractive and classy looking but easy to get through. The gate arrived quickly and was easy to assemble to fit my doorway. 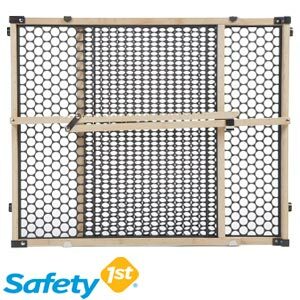 I highly recommend these if you're looking for good, sturdy baby gates. First off, this gate looks "prettier" than my other baby gates. They actually are very nice looking for being baby gates. Looks much better than the cheap baby gates we'd used previously. 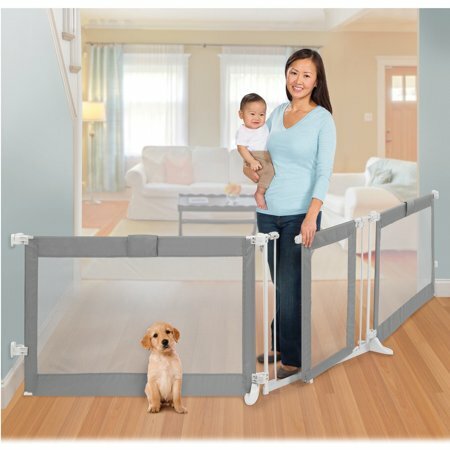 I was afraid of how awful a baby gate would look, but this looks as if it were built into the home. I've a very mobile baby who started walking at 9 months, and I thought I'd protect him from falling down those stairs by buying a good baby gate. It's also tall enough to keep our cats from jumping over, so doubles as a cat and baby gate!. We can easily open the gate with one hand if we're carrying something (for example, a baby). It works well and my 5.5 year old can work it without worrying about him breaking the latch. I've a similar gate by The First Years that works very well. Very strong and well constructed. High enough to keep my cats from jumping over it as well. The color also worked well for our dark cherry wood and doesn't stand out as much as a lighter maple or white colored gate would. Well worth the price which was extremely reasonable. It bowed at first in the middle but this was quickly fixed with some stacked pieces of tape (I suppose a thin piece of wood would work as well). Otherwise the gate works well for the time being and the holes will have to be filled in when finished. It's decorative as well as very functional. It's adjustable to the door frame size and looks nice. It's very easy to work and look nice. It's nice looking, sturdy, and does what it promises to do. I was worried it'd be awful looking, but it really looks nice. Quite sturdy (my son has been climbing on it with no problems), looks very nice with our decor, and I love the door to it. Its seems to be made very well and looks very nice. This gate seems pretty sturdy. This's a very sturdy gate, nice height, nice weight, fairly easy to put together but the very last thing we did was put in the tension knobs and one of them was stripped clean...very annoying. However, I did have to using the mounting hardware instead of just the pressure mount since my stair opening was so wide. The pressure mount is really secure. It works, but we couldn't use the wall foot things to hold the bottom in place. I bought one originally for the top of my stairs and recently purchase a second one for the bottom. If you're going to use this at the top of the stairs, DON'T rely on a pressure mount. Example, our baseboards stick out an inch from the wall so the top fit but the bottom didn't. I love this gate for the bottom of my stairs. 2) It's to be perfectly level and in a standard hallway, it's to measure perfectly at 3" on both top and bottom mounts on either side. He chewed the top and bottom latches over a couple of months and was a free bird! Easy to install and very sturdy. Relatively easy to open and close. It's very nice, easy to install, easy to operate. Easy installation is a plus. A recent remodel required me to keep the dogs indoors . Butter, our lab, can no longer access the kitchen and I've a sturdy, fancy-schmancy, easy to open, easily installed gate. They're sturdy, easy to install, quiet and attractive. The gate looks good, is easy to open for us, but also stands up to our 2 large dogs jumping on it when a delivery person arrives!!!. We needed to secure both a 48" opening and a 28" opening to contain our two large dogs. The door is easy to open with the lift-and-push/lift-and-pull options. The easy one handed opening and automatic return for closing are also good features.